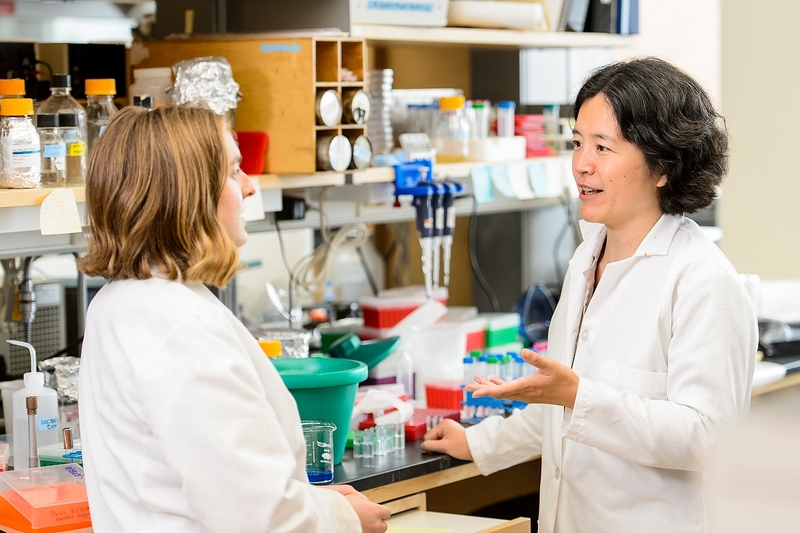 Jue “Jade” Wang, an associate professor of bacteriology at the University of Wisconsin–Madison, has been named a Howard Hughes Medical Institute (HHMI) Faculty Scholar. The recognition comes with research funding for Wang and her laboratory each year for the next five years, as well as support for the institution in order to help cover the administrative costs associated with her work. “We’re very happy that she’s gotten this award,” says Rick Gourse, professor of bacteriology and a colleague of Wang’s in the bacteriology department. The Faculty Scholars Program, created through a partnership between HHMI, the Bill and Melinda Gates Foundation and the Simons Foundation, is intended to boost the work of promising early-career scientists who have already demonstrated excellence in their fields. Wang is one of 84 Faculty Scholars recognized at 43 institutions across the U.S, according to HHMI. This is the first time it has been awarded. Wang was chosen from among 1,400 applicants at 220 institutions. This year’s program will invest around $83 million in research support for recipients and their institutions. Grant awards range from $600,000 up to $1.8 million. “Support for outstanding early-career scientists is essential for continued progress in science in future years,” Marian Carlson, director of life sciences at the Simons Foundation, said in a statement issued by the philanthropies. Wang, who has been at UW–Madison since 2012, studies the physical conflicts between the machinery in bacterial cells responsible for making copies of DNA and the machinery responsible for creating RNA from DNA. She is interested in how such conflicts, in the form of collisions, have shaped the evolution of microbial genomes and how bacterial cells avoid them by coordinating cellular responses to stress. Stress on bacterial cells such as nutrient deprivation or exposure to antibiotics can exacerbate these conflicts. “DNA-RNA polymerase collisions are a big problem because they can result in mutations in the bacterial genome,” says Gourse, who originally helped recruit Wang to UW–Madison. These mutations can lead to the development of antibiotic resistance. According to the Faculty Scholars website, the trajectory for early-career scientists has become much less certain as the competition for grant support has intensified in recent years. In the last two decades, the National Institutes of Health research award success rate for scientists in the U.S. has declined dramatically. The average age at which an investigator receives his or her first major research grant has, meanwhile, increased.